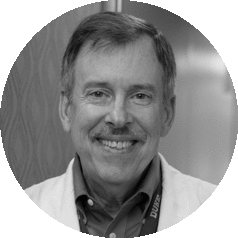 James L. Abbruzzese, M.D., is the Chief of the Duke Division of Medical Oncology and serves as the Associate Director for Clinical Research and Training for the Duke Cancer Institute (DCI). Dr. Abbruzzese is a leading expert in the clinical study and treatment of pancreatic cancer, and his management experience and vision for clinical research and the Division will substantially support cancer care and research at Duke. Before moving to Duke, he held the Waun Ki Hong Distinguished Chair in Translational Oncology and he was Chairman of the Department of Gastrointestinal Medical Oncology and Digestive Diseases at the University of Texas M. D. Anderson Cancer Center in Houston. He earned his medical degree with honors from the University Of Chicago Pritzker School Of Medicine and completed his residency in Internal Medicine at Johns Hopkins Hospital. He also completed clinical fellowships in Infectious Diseases at the Johns Hopkins and in Medical Oncology and Medical Oncology Research Laboratory of Neoplastic Disease Mechanisms at the Dana-Farber Cancer Institute of Harvard Medical School. Before his recruitment to Duke University he spent most of his professional career at M.D. Anderson, where he progressed through the ranks to assume leadership positions as Chairman of the Department of Gastrointestinal Medical Oncology and Associate Vice-Provost for Clinical Research. Among his many accomplishments, Dr. Abbruzzese is a Fellow of the American College of Physicians and Fellow of the American Society of Clinical Oncology. He has co-authored more than 400 research publications and is the immediate past Chair of the Clinical Trials and Translational Research Advisory Committee of the National Cancer Institute. He currently serves as the Chair of the NCI Pancreatic Ductal Adenocarcinoma Progress Working Group.